My girls are... inspired?... dedicated?.... driven?.... crazy?!?! They want to get their Journey Summit award. That means we have to do ALL three Journeys. We did one last year. It took 5 months of meetings. That means we had two left. I found an AMAZING source online that had a rundown of how to do the Amuse Journey in a day long workshop. I was intrigued. The only thing they don't do for you is the Take Action project. If that isn't done, then the journey isn't done. So, I did come up with something for that. 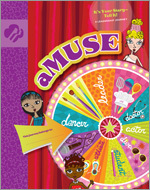 The Amuse Journey is all about stereotypes and the roles women play in the world. It was a great discussion with one young lady that said her Mom was "just a Mom". Ha! A stay-at-home Mom's nightmare come true... her daughter believing she isn't as "important" because she has decided to raise her children rather than work outside the home. We broke down what her Mom did on an everyday basis and showed her (and the other girls) just how important her Mom was and all the different roles she played for her family. I learned a lot about my stepdaughter, too. Things she hasn't expressed interest in were revealed as things she is "too afraid to try, yet wants to". I definitely want to encourage those items, too. It's important to chase dreams, no matter how big or small they are. So, my Assistant Leader and I set up two stations. One on each end of the lodge (our lovely Silver Meadows Program Center which we love dearly!!!!). The girls rotated between the two of us... back and forth. I'm so glad to have an Assistant that can pull this off and has the stamina to go the distance. By the end of the evening, we were done. A whole Journey in one day... it was a major accomplishment. We also had a campfire with onion bombs, corn on the cob, and potato packets. Banana boats and smores were for dessert... yes, both... they had been begging to make banana boats and you can't have a fire and not make smores! It's just not done in GS world, okay?! Problem with that? Back off! You are just jealous of our Thanks A Lot smores... they are to die for! !